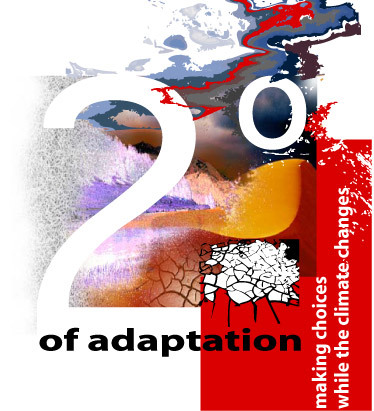 The cast and workshop participants must be willing to explore the internal and external aspects in their lives that contribute to a paralysis regarding changing our behaviours that have led to climate change. 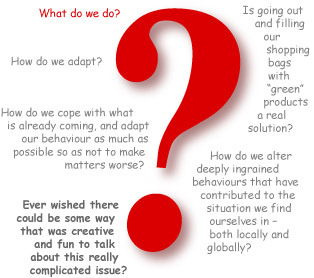 Having a living knowledge of the issue will be one of the essential criteria for participation. If you are keen to explore the struggles in which you are engaged regarding climate change your perspective is valuable to this workshop! We are looking for up to twenty people to participate in a week-long Theatre for Living workshop. No acting experience is necessary. Just a willingness to be honest about your experiences and a desire to play! Participants should identify with the inner struggles that we face making every-day choices that contribute to climate change, and want to do something about it. The workshop will use theatre games and exercises to build trust and explore your experiences around the issue. In the beginning, these games and exercises are non-verbal. Slowly, the workshop will create plays, based on the life experiences of the workshop participants. This will happen through a symbolic, physical language. It is these points of tension that will form the subject matter of play. This workshop does not go to public performance. It’s purpose is to gather the core material for the creation of the Forum Theatre production that will perform in Vancouver in March of 2008. It is very important that you are able to commit to coming to every day all day of the workshop. Each workshop participant will be paid $550.00 for the week and lunch will be provided each day. To become a workshop participant, please send us a letter/email/fax indicating that you are available to commit to the dates and times of the workshop (January22 to 27, 2008, from 9am to 5pm each day). If you have any questions, feel free to give us a call at 604.871.0508. • December 4, 5 and 6, 2007 Participant interviews and cast auditions. All participants will be interviewed. Those interested in being in the play will audition. It is not possible to prepare for this, just bring yourself and be willing to play! • December 13, 2007 Final selections. • January 22 to 27, 2008 Workshop. The THEATRE FOR LIVING workshop will take place from 9am - 5pm each day. Lunch provided. The cast creates the main stage production. • February 20 to March 2, 2008 Performances. The forum theatre production will be performed at The Dance Centre in downtown Vancouver. Six members of the community workshop will create the main-stage Forum Theatre play along with Headlines’ Artistic Director David Diamond and a professional design team. We don’t want the community workshop to be an audition so, if you want to be considered for the cast, you will be asked to do some improvisation work with David during the participant interview. Cast will be paid $600 a week for the duration of the project: January 22 to March 2, 2008.